Shoulder impingement syndrome also known as swimmer's shoulder is a common cause for shoulder pain. It occurs when there is an impingement of the tendons of the rotator cuff as they pass through the shoulder joint. Impingement Syndrome can be diagnosed by an ultrasound scan which helps to visualize the dynamic impingement and detect associated injuries. An ultrasound can visualize what is happening as the shoulder moves through the impingement zone. 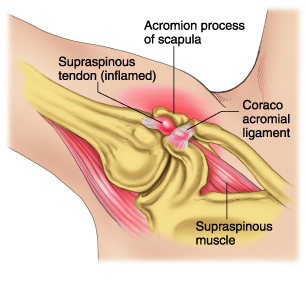 Acromioplasty: Surgery to increase the space between the acromion and the rotator cuff. Dr Bharani Kumar Dayanandam is a one of the best and experienced orthopedic surgeon in Chennai, In his health care institute Knee and Shoulder India he provides advanced and latest correction surgeries for Impingement syndrome at cost affective rates.